Killer acceleration, ultra-streamlined body, wrap-around airbags and dazzling speeds – we’re not talking supercars here but a seabird. 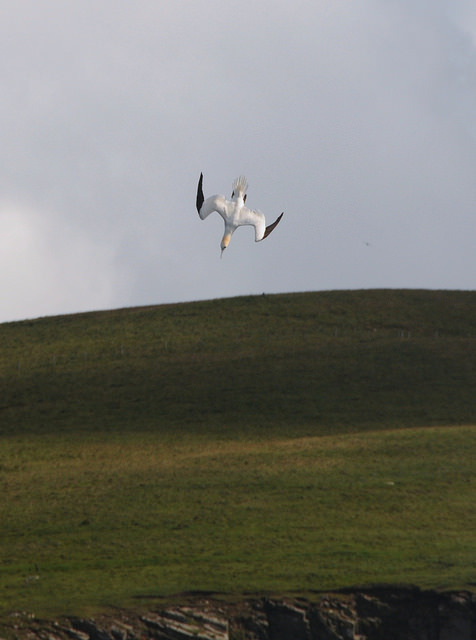 In fact, the biggest seabird in the North Atlantic, with a wingspan of just under 2 m: the northern gannet. For the first years of their lives gannets go through a variety of freckled, brown feather phases. But from about five years old they go for the snowy look. They retain their black outer wing feathers and in the breeding season, a sunny glow of yellow feathers on the neck and head. A gannet has forward facing eyes that, close up, give it a rather stern expression but are also are responsible for the binocular vision which allows it to judge distances accurately. 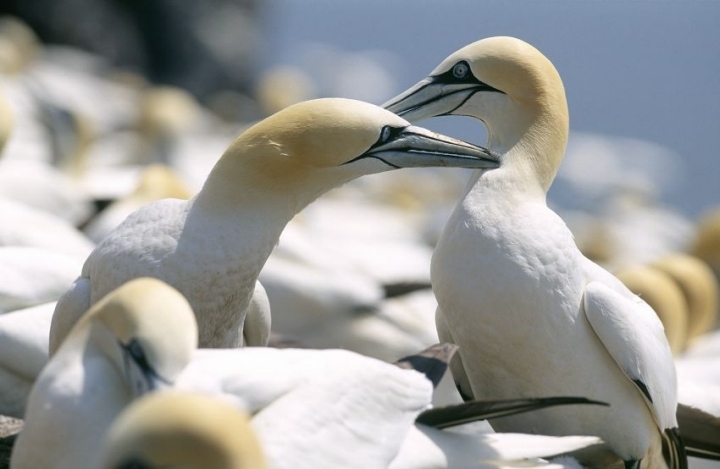 Gannets nest in large colonies on cliffs overlooking the ocean or on rocky islands in the North Atlantic, from the Faroe Islands to Newfoundland and Quebec, but most colonies are concentrated in Britain. Scotland is home to around 60% of Europe’s population. Bass Rock alone hosts more than 150,000 birds, making it the largest northern gannet colony in the world, closely followed by second largest St Kilda. The importance of Bass Rock to the North Atlantic gannet has long been reflected in its scientific name, Morus bassanus. Other Scottish hotspots include Ailsa Craig, Shetland and Troup Head. Gannets live in a stormy, cold and unforgiving habitat. They survive thanks to their body weight and strength: they are able to capture big, strong fish at great depths, and they can fast for a long time thanks to their fat reserves. At speeds of up to 40 mph, a gannet can travel 300 miles in a day as it patrols the steely Atlantic waters in search of shoals of fish such as mackerel, herring and whiting. 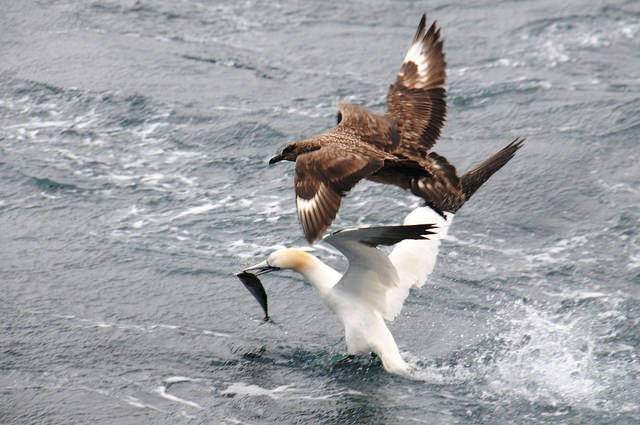 As soon as a gannet spots a fish it plunges towards the prey. As the bird plummets, it adjusts direction in response to the fish’s movements and may even accelerate with powerful strokes of its long, narrow wings. Just before impact against the water the body is straight and rigid, with the wings rotated in their sockets and pulled back tightly. The eyes are shielded by membranes, while air sacs in the head and chest soften the blow. Thanks to these aerodynamic tricks gannets hit the water like arrows, at speeds of up to 62 mph, penetrating up to 5 m below the surface. By using its wings underwater, it can swim even deeper, 15 m down. It is not surprising then that mistakes can be fatal and gannets die of neck and head injuries if their dives are not of Olympic precision, or if they collide with another bird. Fortunately though, accidents are rare and this highly adapted bird is likely to live its typical lifespan of about 17 years. This post is dedicated to the memory of the late Bryan Nelson MBE FRSE, who was the world biographer on the gannet. 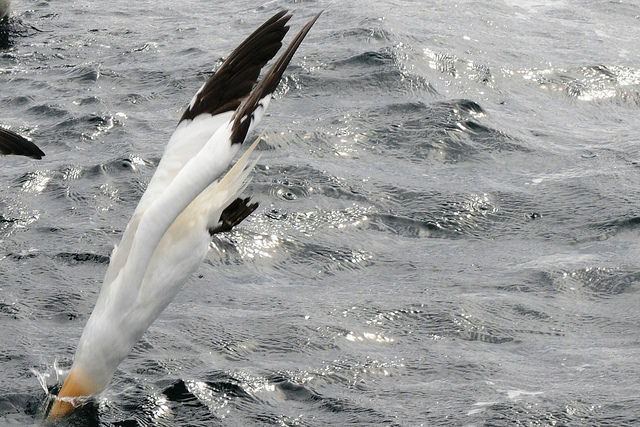 Take a look at these amazing images of gannets diving for fish in Shetland. This entry was posted in biodiversity, Birds, Marine, photography, sea life, Species of the month and tagged Bass Rock, biodiversity, Bird, birds, Coast, gannet, gannets, images, nature, North Atlantic gannet, photography, Scotland, Scottish Natural Heritage, Shetland, SNH, St Kilda, Wildlife. Bookmark the permalink.